In Oslo in 1969 a wealthy business man rings Kolbjørn Kristiansen, the police inspector made locally famous after a tough investigation the previous year, to report he is in fear for his life. Before the two can meet to discuss the issue Magdalon Schelderup dies while dining at home with the 10 people closest to him. It soon becomes clear that only someone at the dinner table could have been responsible for Schelderup’s death but untangling which of them it was proves taxing for K2. Thankfully for him he has assistance from an intelligent young civilian woman. This is the second book in the series to feature K2 and my one (very minor) criticism is that I think you really do need to have read the first novel, THE HUMAN FLIES, to get the most out of this one. Although the mystery itself does not rely at all on any prior knowledge, the way that Patricia came to be K2’s civilian assistant crime solver is not really explained here and I was glad to have known how the two came to know each other from having read the first book. 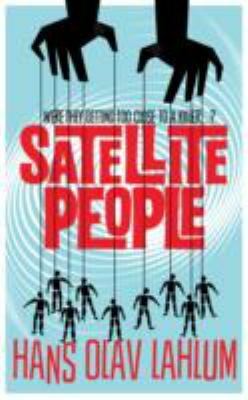 That aside though SATELLITE PEOPLE is a terrific read, especially for fans of the classic whodunit. You don’t need to read the author’s afterword to know he is a fan of such golden age mystery writers as Agatha Christie (to whom the book is dedicated), Arthur Conan Doyle and Georges Simenon. The book’s structure and plotting style are evidence of his regard for them. But Lahlum builds on that foundation with deeper character development than is often found in the classic mysteries. With limited hard evidence available the bulk of K2 (and Patricia’s) investigation relies on a series of interviews with the victim’s friends and family who drip feed the truth almost like it is being tortured from them. Sometimes this storytelling technique can be tiresome but here I thought it was very successful, primarily because the reasons for each person keeping his or her secrets even in the face of police questioning were all very believable. As with the first book parts of this story link back to the second world war. The victim and several other characters were in the resistance and there is one particularly horrible incident that reverberates in their lives even 25 years after it took place. I really like the way Lahlum weaves this history into the narrative and makes it relevant to the novel’s present day. Other plot strands, including the different ways the victim’s wealth and status has impacted his children’s lives and personalities, are equally engaging and at times I quite forgot I was supposed to be looking for clues to murder because I was just caught up in the dram of all their lives. When I wrote my mini-review of THE HUMAN FILES last year there was some discussion in the comments about whether or not Patricia and her role in the investigation is realistic. So I’ll be clear here in the review proper: it isn’t remotely realistic that a police inspector would rely so heavily on a civilian, let alone one so very young and who won’t leave her home. But, as the author so generously noted in that same comment thread, this is crime fiction. If you can’t suspend your disbelief enough to accept her then you ought to read something else. But if you like the dynamic of the classic crime solving duo then you’ll probably appreciate this twist on it. I really do. And maybe, like me, you’ll read between the lines of the final pages and be itching to see what happens in the next installment. SATELLITE PEOPLE offers the best elements of a classic mystery with some modern influences layered over the top. It’s light and fun without being at all twee thanks to its exploration of some complex, psychological issues. In short: something for everyone. This entry was posted in book review, Hans Olav Lahlum, Norway. Bookmark the permalink. Very glad you enjoyed this, Bernadette. I’ve had this series on my radar for quite some time now, and still haven’t started it (shame on me, that’s all!). But it sounds like my kind of story. I think I’m going to have move Human Flies from the radar to the TBR, and then this one as well. Thanks for the link to your interview with Mr Lahlum, nice to know where some of his inspiration comes from. I’m already looking forward to the next book in this series. Yes It is crime fiction, but we all have our limits, like no lightning bolts or earthquakes protecting the innocent while striking the guilty, and no coincidences. But I may give this series another try, as the words “WWII Resistance fighters” sharpen my eyes and ears, and this review is a good one. But the TBR piles from the library and my own stacks are overtaking this place, so I’ll just add it to the list.